ProofPIlot is powerful enough for pharma and academia. But, it's easy enough to use for anyone with a research question. Design your study in ProofPilot's visual protocol designer. Add study tasks from menus of functionality and content covering some of the hottest health and wellness topics. Organize tasks into arms. Automate with activation andexpirationcriteria. Turn your study into an engaging multi-channel media experience. Recruit and engage participants online or off in an experience they actually enjoy. Meet your participants where they're at via e-mail, SMS or push notification without any downloads in almost 30 languages. The ProofPilot Study Protocol designer is a revolutionary way to build your study from menus and templates. See how everything fits together. No more abstract MS word documents. What you see is what you get. Your study protocol is made up of a series of study tasks. Each task is represented by a colored block. Edit each block by clicking, choosing functionality, filling in the blanks and tying together with other study tasks. You can design a study without any external IT resources, without any experience deploying studies with technology and the P.h.D is optional. Data collection and management is at the core of every clinical trial and study. Choose from nearly 600 assessments in our library or create your own. Ask questions with images, create complex skip patterns, and calculate scores. Let participants share data with your study from popular consumer devices and applications like Fitbit, Lifesum, and Google Fit. Need EMR or lab data. We've got that covered too. The ProofPilot approach to data sharing provides nearly limitless opportunities, many with minimal IT requirements. Not every data element can be expressed in a quantitative structured format. Let participants fully express themselves. Add photographic, video or audio data collection. Run interventional trials and measure the impact of treatments ranging from folk remedies to biotech innovation. Add single and repeating reminders for participants to take medications and complete offline activities. Provide more in-depth information to patients and their clinicians via long-form written instructions and video. Place intervention and treatments in experiment arms. Create control arms for comparative analysis. Create randomization procedures and automatically assign participants to the appropriate arm. Assess digital interventions, group-based counseling sessions, behavior change prompts, and traditional in-person curriculum. ProofPIlot supports interventions including, but not limited to medications and medical devices. Create study task activation and expiration criteria by completing sentences. ... Or mark tasks as one only available when a participant comes in for a study visit. 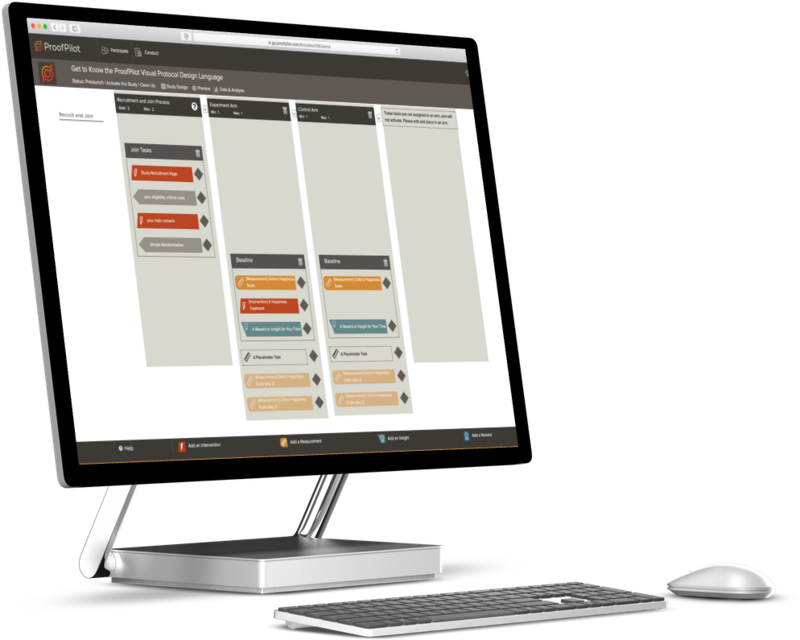 Activate tasks to participants automatically based on previous behavior in the study and previously collected data. Do the same to expire tasks if they aren't completed within a window period. 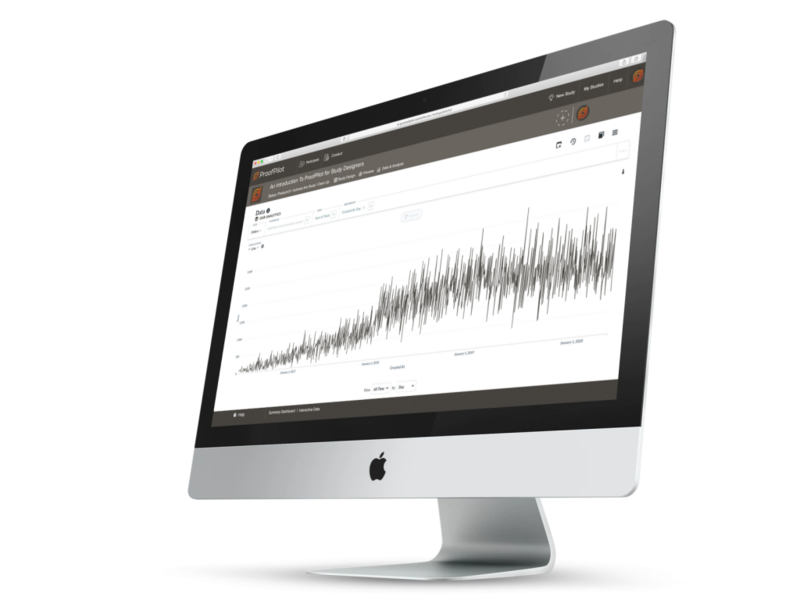 Wait for minutes, days or months after a prior behavior or data element is collected. Or activate tasks based on time: Activate repeating tasks at the same time every day. Or start a task on a specific day. Your study design turns into a participant experience across whatever device a participant has access to. All without any downloads. Support cross-channel experiences with special functionality for in person study tasks. Your recruitment and join process turns into a consumer-friendly experience. ProofPilot includes special functionality allowing professionals from clinicians to volunteers to invite participants in person or over the telephone with e-mail or SMS message. While every study has it's own URL it doesn't stop there. Share a special SMS code in your traditional media. Participants and browsers alike can use specially designed social share features to build additional awareness. There's no bland or wonky user experience here. If a participant would like to join a study, they'll register in a process that's been tested and optimized for usability and high conversion rate. The ProofPilot join experience walks potential participants throught the enrollment process. With or without a study professional. Collect additional info. Ensure specific pre-enrollment activities have been completed. Automatically determine if the participant is eligible with a defined set of eligibility rules set in your study design. Help participants understand the risks and benefits of participating in the study. Present the information in an engaging way with summaries and images. Confirm by e-signature or an "I Accept" click. 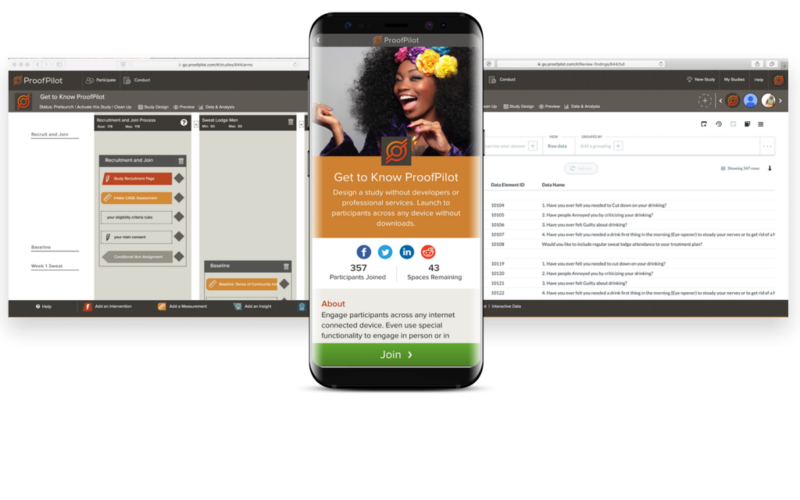 Participants may set and update their language, timezone, communication preferences, contact information and more directly from the ProofPilot participant application. You set up your study design. ProofPilot automatically repurposes your material in e-mail, SMS, and push notifications based on a participant's preferences. Add gift cards and stored value cares from more than 100 partners in 26 countries and six currencies. Or choose non-financial rewards like coupons, promotions or informational insights. ProofPilot is localized in more than 30 languages. But it's not just language. Create study templates and deploy different versions of your study to appeal different participant populations and stakeholers. Once you've launched your study, all you do is sit back and watch the data roll in. ProofPilot maintains all your data in an encrypted format and presents it to you stripped of identifiers for the highest scientific rigor and privacy protections. Repeating measures, whether from a connected health device or a participant reported outcome are organized to help you identify if there are changes over time. Is your study an experiment or are you comparing two different populations? Each data element includes the arm a participant is in, helping you determine if there are differences. Create bar graphs, line graphs. Group and summarize data. Save the view and return as data updates. And, export data in CSV, Excel and JSON format. Every study on ProofPilot goes through an IRB review. Don't have an IRB? ProofPilot has one integrated in the platform. All data is encrypted, backed up, and stored in a format adherant to US health regulations. ProofPilot has the appropriate documentation, processes and logs in place to prove CFR Part 11 compliance. For studies engaging EU residents and citizens, ProofPilot provides all the features necessary to operate within the standards.